Hawk Mountain Sanctuary currently has 4 education ambassadors. Each bird is carefully monitored and cared for by the education staff as well as trained volunteers at Hawk Mountain. 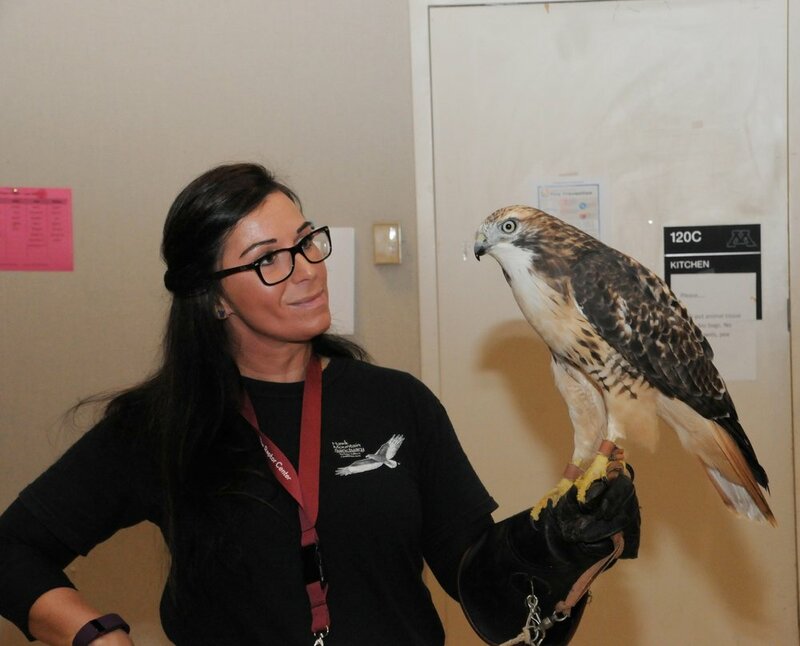 Our avian education ambassadors are trained to work with the staff to educate the public, and they represent their wild counterparts as they travel near and far. However, every bird requires daily care and yearly examinations. I enjoy travelling out to Hawk Mountain every spring to see the birds. At times, the birds will travel out to me for any issues concerning to the raptor care staff. So, how do wild raptors become education ambassadors? Due to injury, amputation, blindness or imprinting, raptors that come into a rehabilitation facility are determined to be unfit for release and in turn become captive raptors for education. The federal government mandates specific guidelines and criteria which must be met prior to releasing a bird of prey back into the wild. In raptors 6 weeks or younger, we worry about imprinting on humans. If this occurs the animal becomes non-releasable. We see imprinting commonly in baby cranes, vultures and other avian species. A captive raptor requires yearly exams and wellness blood work just as our companion animals. Raptors are considered wild animals, even in captivity and their care is much different from that of a dog. Birds hide illness and therefore require a physical exam and blood work yearly. The day to day care, includes monitoring their appetite, weight and activity. When a bird is transferred to a facility, an initial physical exam, x-rays and blood work are performed. During physical examination, I will evaluate the eyes, mouth, ears, listen to the heart and respiratory system and perform a full orthopedic examination. Feather and skin condition is also evaluated. When housed in a captive setting, especially birds with orthopedic limitations or previous fractures, raptors are prone to feather damage and foot injuries. Together with the raptor care team, I will review options to help improve feather quality, foot care and cage enrichment. 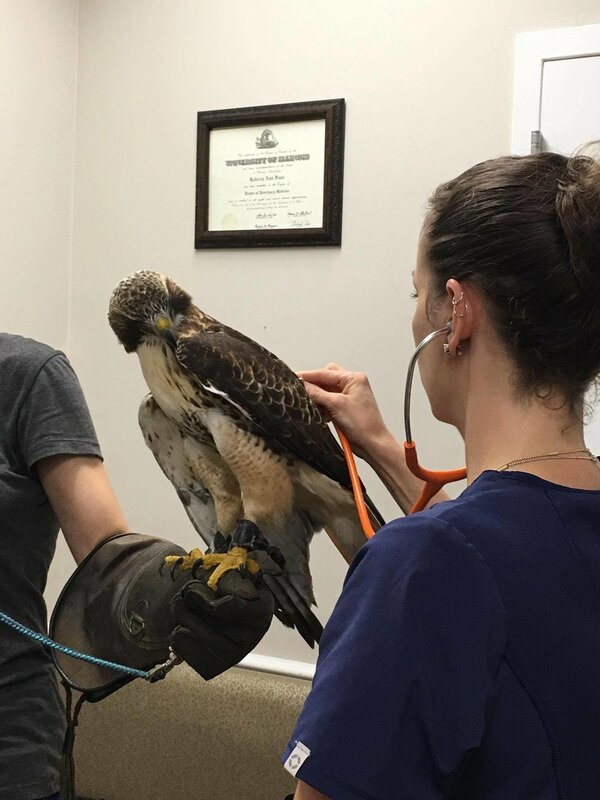 At Hawk Mountain Sanctuary, a physical examination is performed, blood is drawn and xrays are recommended. 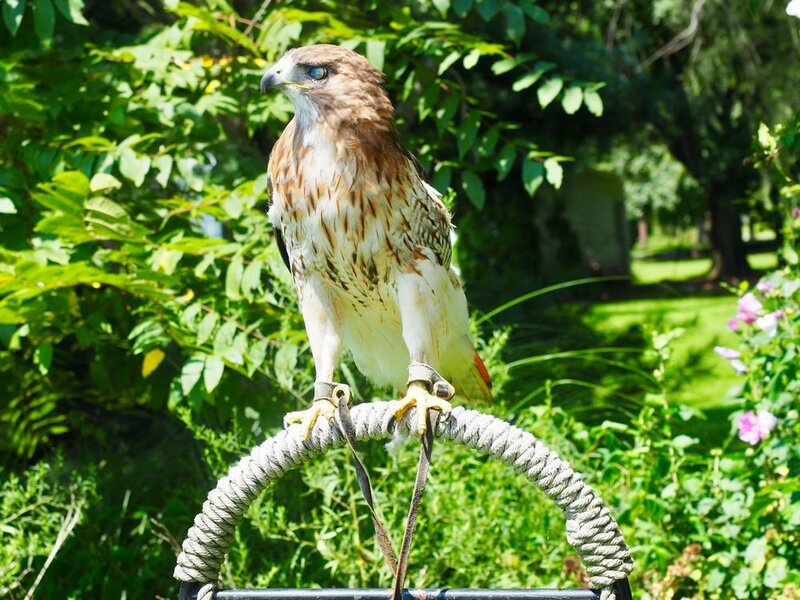 It is also recommended that all captive raptors be vaccinated for West Nile Virus (WNV). The WNV vaccine is administered once a year prior to mosquito season. This is the only recommended vaccination. At the time of intake, all of the birds are DNA sexed and this is because our female birds require higher levels of calcium and monitoring for egg laying behavior. The birds can produce an unfertilized egg, without a male present. Currently, all of the education birds at Hawk Mountain are female, except the newest member, a red-morph eastern screech owl. 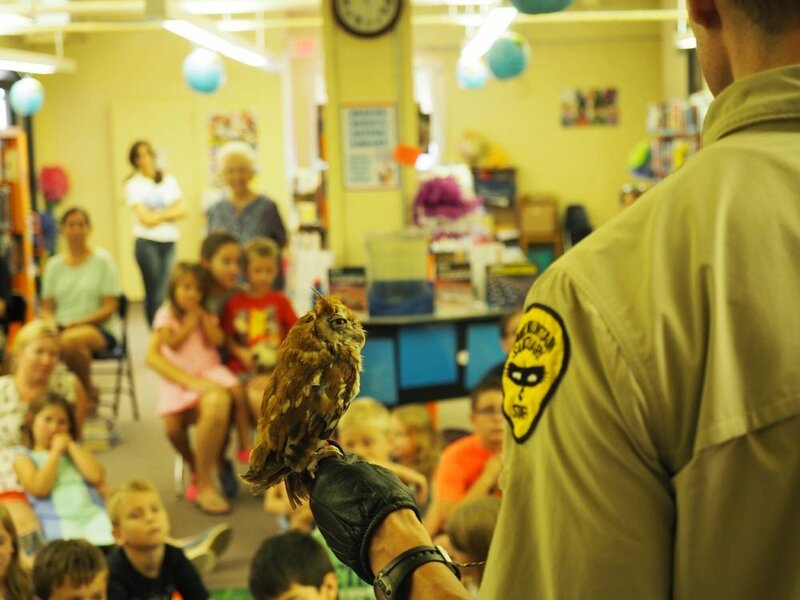 The red-morph eastern screech owl was recently adopted by Hawk Mountain for education purposes. He has a right wing injury that limits his flight, therefore he has been determined unfit for release into the wild. He received his intake examination in January 2017. The small owl was found to be dehydrated with multiple broken tail feathers and contracture to his right wing. Despite his severe right wing damage, he is still able to fly a little. During his examination we administered his WNV vaccination and took some blood to evaluate him for any illness. During my visit, I also had the luxury of examining my favorite great-horned owl. GHOW is at least a 17 year old female who recently started laying eggs. She also has developed some abnormal wear to her beak and receives occasional coping (beak shaping). I look forward to my spring visit this year when I will have the opportunity to vaccinate and examine the entire flock of avian ambassadors at Hawk Mountain.